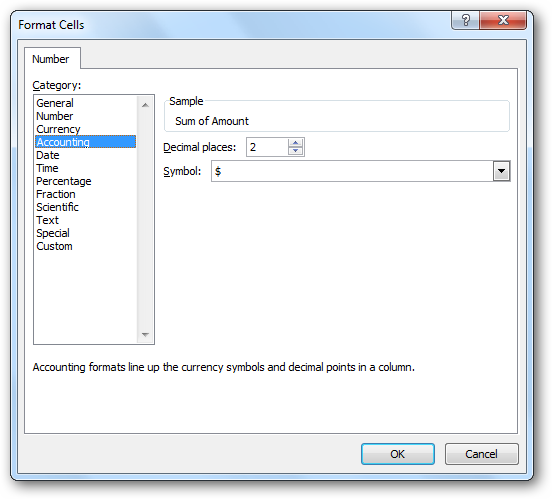 PivotTables are one of the most powerful features of Microsoft Excel. They allow large amounts of data to be analyzed and summarized in just a few mouse clicks. In this article, we explore PivotTables, understand what they are, and learn how to create and customize them. Note: This article is written using Excel 2010 (Beta). 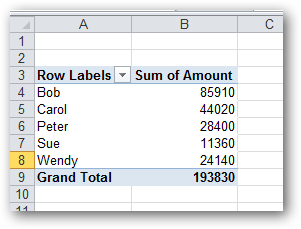 The concept of a PivotTable has changed little over the years, but the method of creating one has changed in nearly every iteration of Excel. If you are using a version of Excel that is not 2010, expect different screens from the ones you see in this article. In the early days of spreadsheet programs, Lotus 1-2-3 ruled the roost. Its dominance was so complete that people thought it was a waste of time for Microsoft to bother developing their own spreadsheet software (Excel) to compete with Lotus. Flash-forward to 2010, and Excel’s dominance of the spreadsheet market is greater than Lotus’s ever was, while the number of users still running Lotus 1-2-3 is approaching zero. How did this happen? What caused such a dramatic reversal of fortunes? Industry analysts put it down to two factors: Firstly, Lotus decided that this fancy new GUI platform called “Windows” was a passing fad that would never take off. They declined to create a Windows version of Lotus 1-2-3 (for a few years, anyway), predicting that their DOS version of the software was all anyone would ever need. 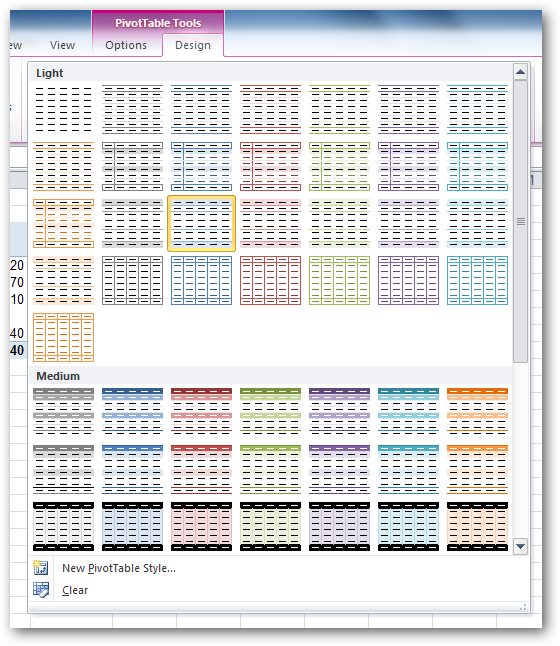 Microsoft, naturally, developed Excel exclusively for Windows. 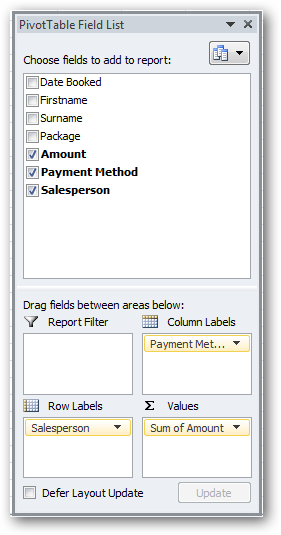 Secondly, Microsoft developed a feature for Excel that Lotus didn’t provide in 1-2-3, namely PivotTables. The PivotTables feature, exclusive to Excel, was deemed so staggeringly useful that people were willing to learn an entire new software package (Excel) rather than stick with a program (1-2-3) that didn’t have it. This one feature, along with the misjudgment of the success of Windows, was the death-knell for Lotus 1-2-3, and the beginning of the success of Microsoft Excel. 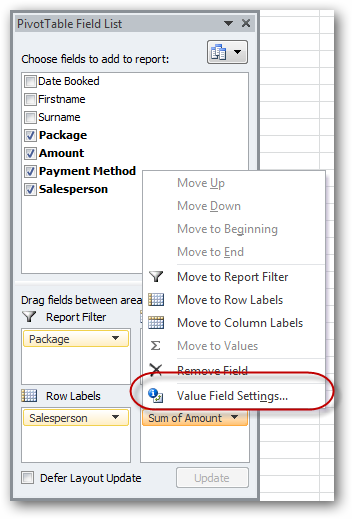 So what is a PivotTable, exactly? The data that you analyze using a PivotTable can’t be just any data – it has to be raw data, previously unprocessed (unsummarized) – typically a list of some sort. An example of this might be the list of sales transactions in a company for the past six months. Notice that this is not raw data. In fact, it is already a summary of some sort. In cell B3 we can see $30,000, which apparently is the total of James Cook’s sales for the month of January. So where is the raw data? How did we arrive at the figure of $30,000? Where is the original list of sales transactions that this figure was generated from? It’s clear that somewhere, someone must have gone to the trouble of collating all of the sales transactions for the past six months into the summary we see above. How long do you suppose this took? An hour? Ten? 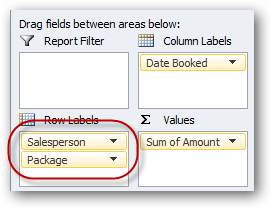 You may be surprised to learn that, using the PivotTable feature of Excel, we can create a monthly sales summary similar to the one above in a few seconds, with only a few mouse clicks. We can do this – and a lot more too! 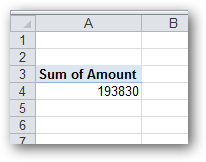 First, ensure that you have some raw data in a worksheet in Excel. A list of financial transactions is typical, but it can be a list of just about anything: Employee contact details, your CD collection, or fuel consumption figures for your company’s fleet of cars. 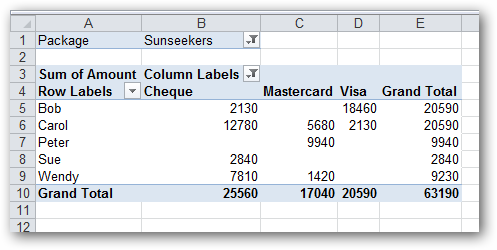 Once we have the list open in Excel, we’re ready to start creating the PivotTable. The list of fields in the top part of the box is actually the collection of column headings from the original raw data worksheet. The four blank boxes in the lower part of the screen allow us to choose the way we would like our PivotTable to summarize the raw data. 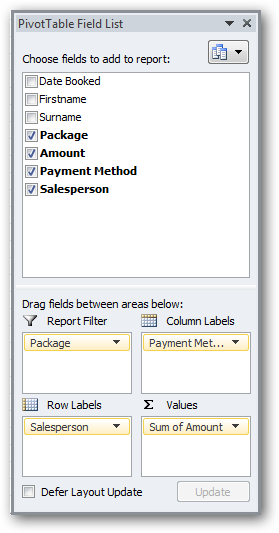 So far, there is nothing in those boxes, so the PivotTable is blank. All we need to do is drag fields down from the list above and drop them in the lower boxes. 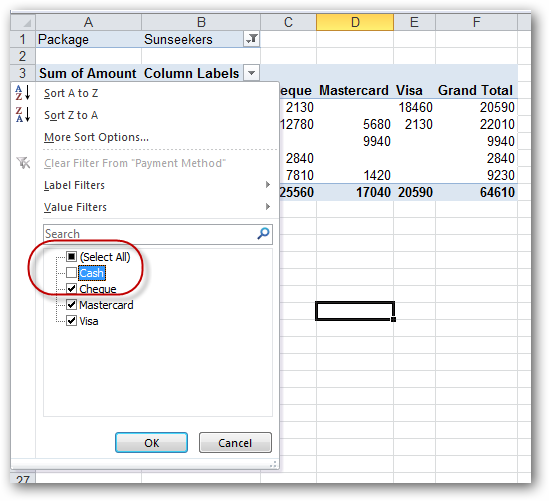 A PivotTable is then automatically created to match our instructions. If we get it wrong, we only need to drag the fields back to where they came from and/or drag new fields down to replace them. 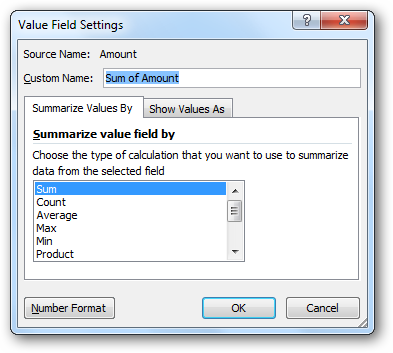 Notice that (a) the “Amount” field in the list of fields is now ticked, and “Sum of Amount” has been added to the Values box, indicating that the amount column has been summed. 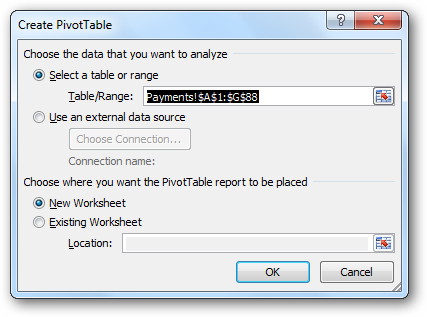 We’ve created our first PivotTable! Handy, but not particularly impressive. It’s likely that we need a little more insight into our data than that. Now, finally, things start to get interesting! Our PivotTable starts to take shape…. With a couple of clicks we have created a table that would have taken a long time to do manually. So what else can we do? Well, in one sense our PivotTable is complete. We’ve created a useful summary of our source data. The important stuff is already learned! For the rest of the article, we will examine some ways that more complex PivotTables can be created, and ways that those PivotTables can be customized. Starting to get very cool! Notice where it ends up…. Let’s see what that looks like…As you can see, “Cash” is gone. This is obviously a very powerful system, but so far the results look very plain and boring. For a start, the numbers that we’re summing do not look like dollar amounts – just plain old numbers. Let’s rectify that. A temptation might be to do what we’re used to doing in such circumstances and simply select the whole table (or the whole worksheet) and use the standard number formatting buttons on the toolbar to complete the formatting. The problem with that approach is that if you ever change the structure of the PivotTable in the future (which is 99% likely), then those number formats will be lost. We need a way that will make them (semi-)permanent. 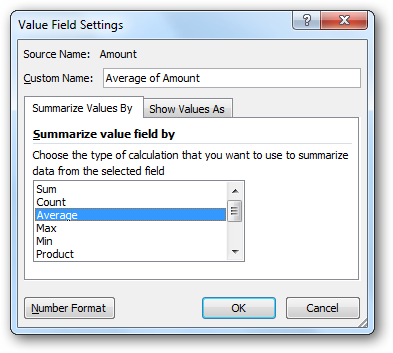 The Value Field Settings box appears. As you can see, the numbers have been correctly formatted as dollar amounts. We can work with dates as well. Now usually, there are many, many dates in a transaction list such as the one we started with. 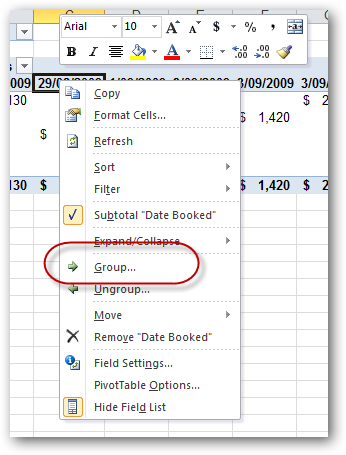 But Excel provides the option to group data items together by day, week, month, year, etc. Let’s see how this is done. 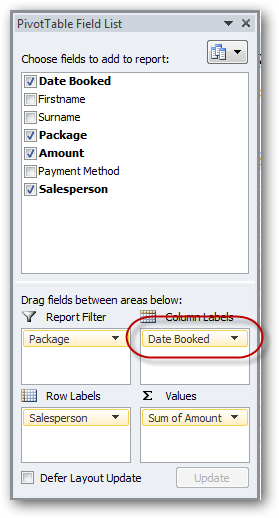 As you can see, this makes our PivotTable instantly useless, giving us one column for each date that a transaction occurred on – a very wide table! You can do a similar thing with column headings (or even report filters). Keeping things simple again, let’s see how to plot averaged values, rather than summed values. If we like, we can even have sums, averages and counts (counts = how many sales there were) all on the same PivotTable! 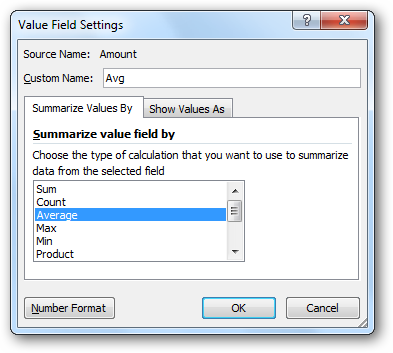 Total, average and count on the same PivotTable! There are many, many more features and options for PivotTables created by Microsoft Excel – far too many to list in an article like this. 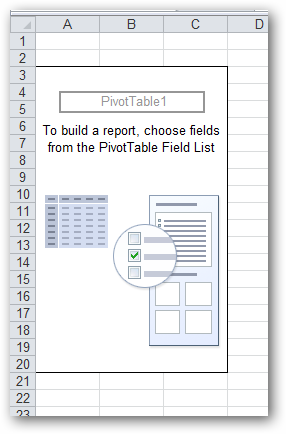 To fully cover the potential of PivotTables, a small book (or a large website) would be required. Brave and/or geeky readers can explore PivotTables further quite easily: Simply right-click on just about everything, and see what options become available to you. 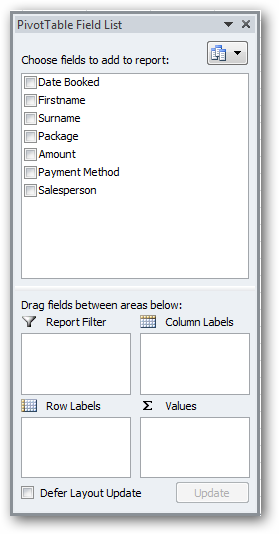 There are also the two ribbon-tabs: PivotTable Tools/Options and Design. 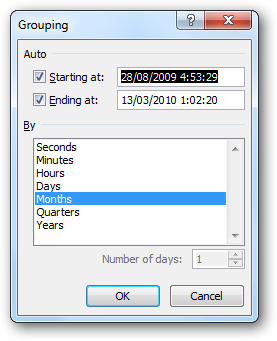 It doesn’t matter if you make a mistake – it’s easy to delete the PivotTable and start again – a possibility old DOS users of Lotus 1-2-3 never had. 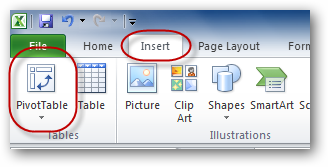 If you’re working in Office 2007, you might want to check out our article on how to create a PivotTable in Excel 2007. 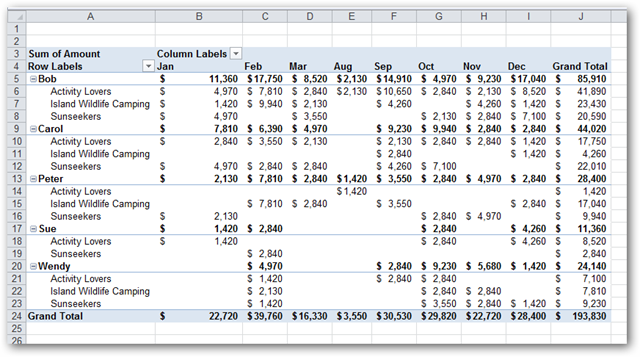 We’ve included an Excel workbook that you can download to practice your PivotTable skills on. It should work with all versions of Excel from 97 onwards.